2 & 3 Bedrooms Sleeps 4-6 Changeover Saturdays. 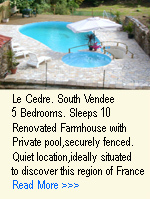 4 Gite Complex with Heated Pool. Prices £375 to £920 pw. Manoir de Coat Amour. Morlaix. Finistere. Beautiful Manoir ofering 1-3 bedroom gites + B&B. 12 Acres of parkland, Heated Pool. Prices from 410-1300 euros pw. La Lohuas. Les Champ Geraux, Nr. Dinan. 2 & 3 Bedrooms. Sleeps 4-7. 5 Gite Complex in 4 acres of gardens. Prices from £230 to £680pw. La Maison Blanche. Quistinic. Morbihan. Beautiful privately owned gite with Heated Pool. 2 Bedrooms, Sleeps 8, Changeover Saturdays. beaches. Well located for ferry ports and Brest Airport. Prices from: £250 to £500pw. 2 Gites in 16th Century Farmhouse. Prices from: £180 to £890pw. Four gites set in an idyllic location, rural but near to the village and to Mont Saint Michel. Comfortably furnished, a heated pool and over 2 acres of secure gardens. Gites by Jewells. Caulnes. 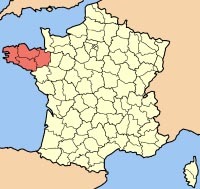 Cote d'Armor. 1 -3 Bedrooms. Sleeps 2 - 8. Changeover Saturdays. Traditional granite Breton cottage,30 kms from beaches. Sorry no pets. 1 Bedroom. Sleeps 3. Changeover Saturdays. Pretty Cottage in the Monts d'Arree within the Armorique National Park. 30 mins to coast & Roscoff. Prices from: €200 to €290 per week. Typical Breton stone built terrace cottage. Prices from: £225 to £405 pw. Clemella Gite. Pilair Questembert. Morbihan. Beautifully renovated gite set in a quiet hamlet ideally located for shops, country side and an easy drive to the beach. Clemella cottage Pilair Questembert. Morbihan. Beautifully renovated single story cottage set in a quiet hamlet ideally located for shops, countryside and an easy drive to the beach. Prices from: £400 to £525 pw. Prices from. £515 to £1255 per week. 1 Bedroom, Sleeps up to 4. Beautifully and tastefully restored cottage in the heart of Brittany. Peaceful rural location, few minutes drive from the local amenities. Situated well for travel to the major tourist attractions, 10 minute drive to the beautiful medieval town of Josselin. La Villeneuve Gites, Riec-sur-Belon. Finistre. Large gites complex in 9 acres of woodlandand grassland, Secure heated swimming pool. Two peaceful stone cottages of character, Affordable holiday accommodation in a rural setting near to amenities. 40 minutes from lovely beaches. Situated on the westernmost tip of Finistère, La Crèche lies at the end of a private country lane, just five minutes drive from the unspoilt rugged coastline and quiet sandy beaches.